Background The prevalence of malignancy in patients with small solid pancreatic lesions is low; however, early diagnosis is crucial for successful treatment of these cases. Therefore, a method to reliably distinguish between benign and malignant small solid pancreatic lesions would be highly desirable. We investigated the role of endoscopic ultrasound (EUS) elastography in this setting. Methods Patients with solid pancreatic lesions ≤ 15 mm in size and a definite diagnosis were included. 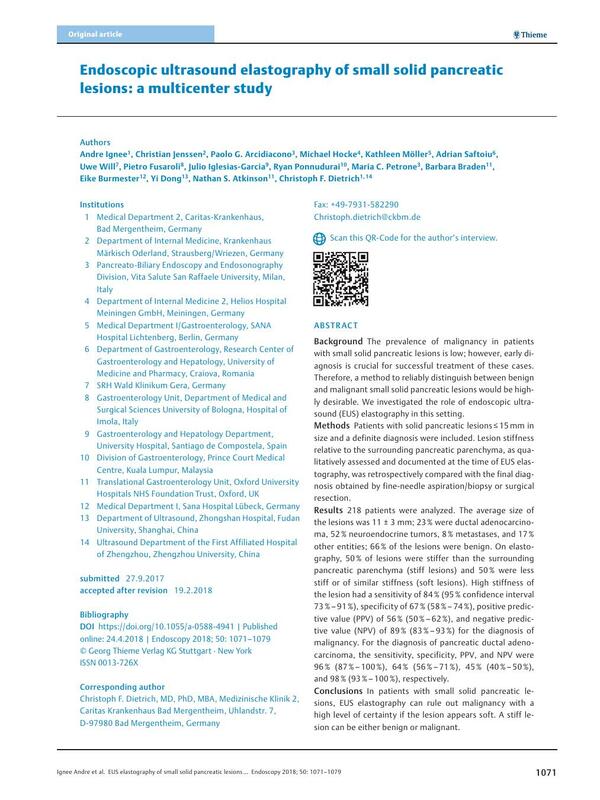 Lesion stiffness relative to the surrounding pancreatic parenchyma, as qualitatively assessed and documented at the time of EUS elastography, was retrospectively compared with the final diagnosis obtained by fine-needle aspiration/biopsy or surgical resection. Results 218 patients were analyzed. The average size of the lesions was 11 ± 3 mm; 23 % were ductal adenocarcinoma, 52 % neuroendocrine tumors, 8 % metastases, and 17 % other entities; 66 % of the lesions were benign. On elastography, 50 % of lesions were stiffer than the surrounding pancreatic parenchyma (stiff lesions) and 50 % were less stiff or of similar stiffness (soft lesions). High stiffness of the lesion had a sensitivity of 84 % (95 % confidence interval 73 % – 91 %), specificity of 67 % (58 % – 74 %), positive predictive value (PPV) of 56 % (50 % – 62 %), and negative predictive value (NPV) of 89 % (83 % – 93 %) for the diagnosis of malignancy. For the diagnosis of pancreatic ductal adenocarcinoma, the sensitivity, specificity, PPV, and NPV were 96 % (87 % – 100 %), 64 % (56 % – 71 %), 45 % (40 % – 50 %), and 98 % (93 % – 100 %), respectively. Conclusions In patients with small solid pancreatic lesions, EUS elastography can rule out malignancy with a high level of certainty if the lesion appears soft. A stiff lesion can be either benign or malignant.